Google has once again updated its Platform Version data, showing how the Android ecosystem was put together during the two-week period ending May 1st. Google gets these numbers by counting devices that access the Play Store, so it comes with a few caveats about accuracy. 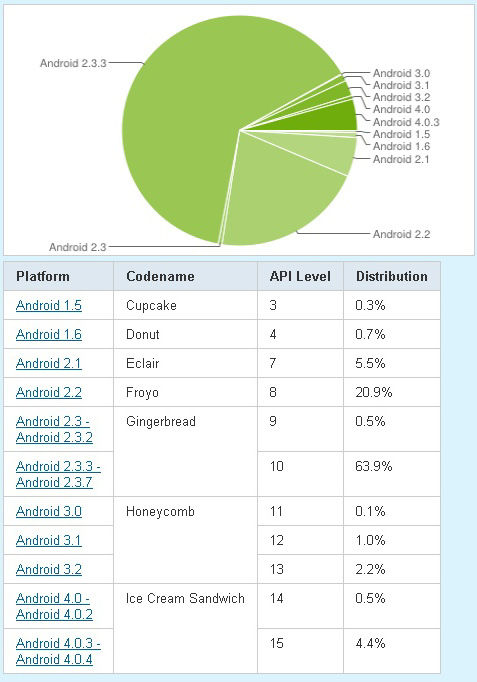 Despite the growth of “Ice Cream Sandwich” use, Android 2.3 is still on the increase as well, up to 64.4% of the known Android world this month from 63.7% last month. That’ll be the new buyers coming onboard. Hello, new people.